It is good that you have not littered. You must do that whenever you trek independant of whether it is green-week or not. But one question: By carrying other's paper garbage What do we gain ? Paper is degradable anyway. I meant plastic waste not paper waste. Will rephrase it. A nice blog. Covers our expedition appropriately. 2. 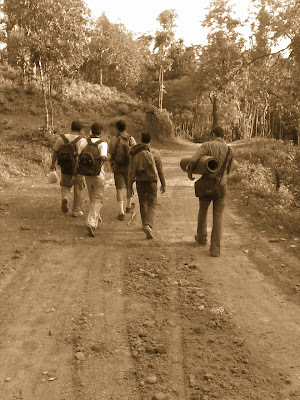 We packed fruits and snacks, then went to the stream near the temple, then had darshan and finally started the trek. 4. Mention the fact that although we had great plans of starting by 6 am, we actually managed to leave only by 7:20. 5. 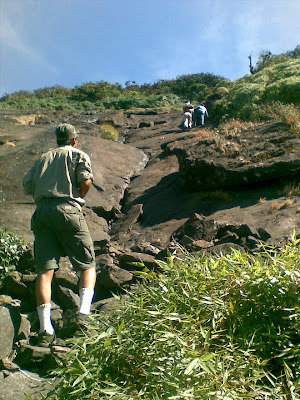 Mention about the steep climb and there's an alternate path with lesser risk. 6. Mention that we started the descend from the peak @ 12:05 pm. 7. The second gang descended @ 6:40 pm. 8. It wasnt a spark actually. Nattu was saying all along to have a bath in river. Finally, we gave in to his persistence. 10. 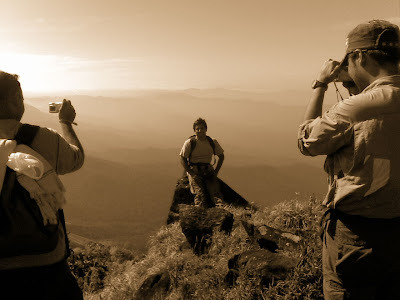 You may also mention how other trekking groups fared: some did not go beyond Bhattara Mane, some returned from the mantap, some halted at the peak, some started from Somwarpet side and got down at Kukke, some did it vice-versa, and some, like us, started from Kukke and ended it there. Will do the changes asap. We are planning a trip on 21st ..
And is the trek very dangerous ?? No Aranya, there are no leeches as of now. Its hot an humid there. They are seen only in monsoon season. Also its would be a tiring trek, plan the climbs during evening or early morning. So you save lot of energy. Time between 11-3pm its going to be really hot, if its not cloudy. Have a litter free trek. hmm Really great that u people made it to the top. 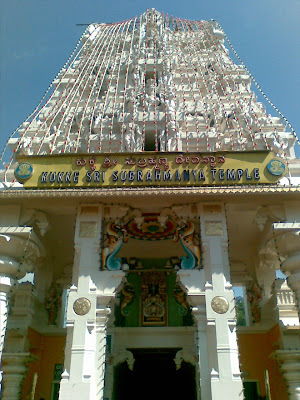 Nice blog for first timers who are going to Kumar parvatha. Nice blog. Trek to Kumara Parvatha (or KP) is a hell of an enjoyable one. And, the amount of detailing in your blog gives a complete picture.